(iv) the commutative principle applies to both ‘+’ and ‘x’, so that ‘1 x 2’ is the same as ‘2 x 1’ and ‘1 + 2’ is the same as ‘2 + 1’, but ‘1 divided by 2’ is not the same as ‘2 divided by 1’ and 1-2 is not the same as 2-1. Confusion about the notation or terminology can easily snowball if areas of confusion are not addressed directly. In many cases a student who may be an intrinsically good mathematician is put on a path toward failure because the underlying problems are not addressed and students never learn the basis of their mistakes as the wheels of math instruction keep turning and piles of math homework add up. The overwhelming majority of dyslexic students would benefit from shorter homework assignments and more time dedicated to figuring out why mistakes occurred. In a large research study of dyslexic and non-dyslexic students performing math work, research Dr. Lynn Joffee found that there were many many mistakes that students continued to make although their non-dyslexic counterparts improved. For example, in the graph below, groups 1-3 on the x-axis indicated increasing age groups taking the tests (3 being the oldest). Dyslexic students continued to make errors in the category of “reversals, sequencing, and direction” although non-dyslexic students improved. 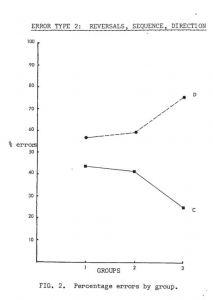 Carrying and Operation Errors were showed a similar pattern; older dyslexic students continued to make mistakes where as non-dyslexic students improved over time. Carrying and operation errors also fell into predictable categories – for instance, forgetting to carry, or carrying, but not including the regrouped number. What dyslexic students need is additional time and support to grasp the procedural aspects of math before struck with ‘failure’ and all the other things that go along with it. Once the early procedural steps of math are mastered, dyslexic students may find to their surprise that they are quite good at math because of strengths in logical and pattern recognition. Will do Tricia! Maybe we can have more on Algebra for our November Premium issue!